in a fun online language learning game. 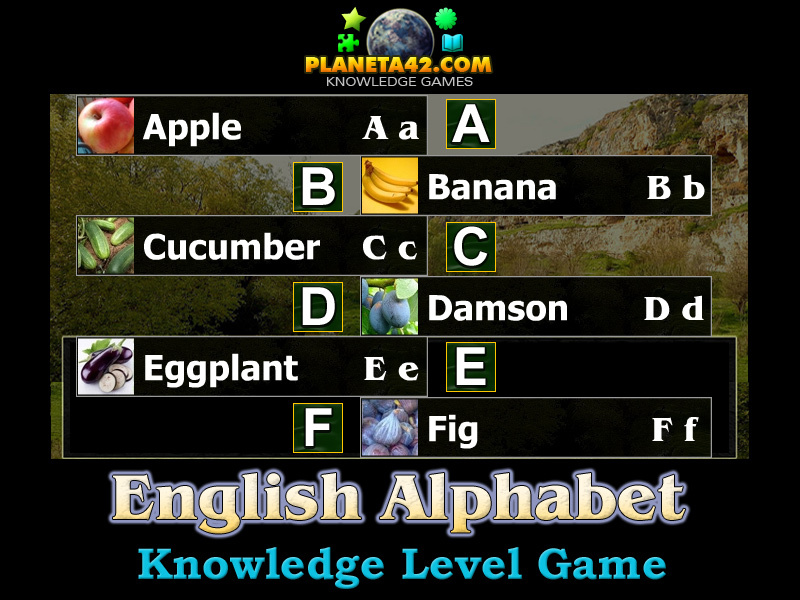 "English Alphabet Puzzle" is a free online knowledge level game to study or test the English Alphabet. computers, laptops and tablets, which may be played in the web browser. The Language Knowledge Board include 26 letters to play with. Part of the Interactive Learning Classroom educational tools. How many letters does the English alphabet have? Which is the 15th letter from the alphabet? Plants or animals beginning with the first letter from the alphabet? What is a good way to examine the Alphabet for kids? How many letters have the English alphabet? How to play English Alphabet Puzzle. This is a simple mosaic game. Drag and drop the letters from the upper part of the screen, on their correct number in the alphabet panel. Some words may be hidden one under another. On wrong drop the letter will be returned in the hand. There is a timer for examination, which may be switched off, for just having some exciting time with the game. Know the English Alphabet and some animals, fruits or plants, beginning with every first letter. file for Windows OS with local levels only. Here are gameplay movies of Planeta 42 Games on YouTube. Labels: Games with Letters , Mosaic Games , Flash Games , Language Games , Education Games , Free Online Games.